Just recently I’ve discovered the The Aspen Institute and it’s full of great information website. The Institute’s mission is to foster creative thinking & leadership for the good of our society and for the past 60 years it’s members have been organizing seminars, public conferences and policy programs to spread great ideas and learn from each other. One of the most recent publications from the Institute is the “Identity in the Age of Cloud Computing: The next-generation Internet’s impact on business, governance and social interaction” by J.D. Lasica, who is a long time blogger for Socialmedia.biz, writer, strategist, journalist & entrepreneur. 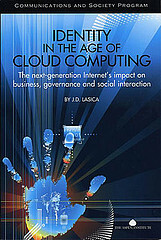 As the title suggests, the book “examines the migration of information, software and identity into the Cloud and explores the transformative possibilities of this new computing paradigm for culture, commerce, and personal communication. The report also considers potential consequences for privacy, governance and security, and it includes policy recommendations and advice for the new presidential administration.” This is a very interesting and forward looking report that can give you an inside to how the online world will look in the future (and not very distant future!). Just imagine all your files (from your pictures and family movies to your tax documents, contracts, receipts & bank statements), your medical records, your credit history & all your activity online being recorded and stored on some huge computer across the world and think what the implications of it could be… How would it affect the global economy and security… what possibilities it might open.. The scary part is that we are already half way there and very much so not prepared for the changes this technology will bring! I would definitely recommend reading (or at least looking through) this report if you do any work with computers or people. It is also worth noting that this and other publications from The Aspen Institute are covered under a Creative Commons license (on Lasica’s recommendation!) to further encourage the spread of socially conscious ideas and leadership around the world. If you are not a big fan of .pdf books, you can always order a hard copy for only $12 on the institute’s website.